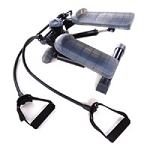 Discontinued Sorry, the manufacturer is out ofbusiness.See More GreatExercise Equipment! Product: DM-4600 Fitness Essentials B-Stock Home Exercise Orange and Black Upright Bike with 28.6 lb Fly Wheel, Electronic Console, Wheels, Handle Bars and Adjustable Seat, Arm rest and Pedal with Straps. Break block and durable tension strap provides varied resistance. **Note - B-Stock means the bike has miscellaneous issues like scratches, dings, dents, faded paint spots etc. but you save a lot of money in the cost. This attractive and aesthetically pleasing, high quality bike is now available for home use at a discounted price. Get in shape at home. This exercise Upright Bicycle provides a great cardiovascular workout with varied resistance and an electronic console to measure scan, speed, time, calories, distance and optional hand pulse. Seat adjusts vertically and horizontally to vary your workout. Purchase more than 1 and save 50% off the shipping of each additional bike. Local pickup available in Logan, Utah to avoid shipping charges. Packaging Dimensions are approximately: 39 3/8" x 32" x 8 5/8"
Some of these features are similar to the features and description provided by the manufacturer of the 5956. Resistance Knob and Durable Tension Strap: Home Upright Bike comes equipped with a simple to use resistance knob. Adjust your resistance quickly and easily by simply turning the dial. Weighted Flywheel: The exercise bike weighted flywheel creates "momentum" to keep the pedals moving. Weighted flywheels translate into a non-impact workout and a smooth pedal stroke. Slick Handlebar Design: Handle Bar provides comfort and safety for various riders. Seat: Padded seat offers you comfort and balance during your workouts. The seat is also vertically and horizontally adjustable so you can personalize the fit. Frame: Steel frame for strength and durability. Seat Post: Adjustable seat accommodates most heights so you can create a perfect fit. Seat Slider: Part of the seat adjustment. Pedals: The Exercise bicycle is equipped with standard pedals. Adjustable pedals accommodate various shoes sizes. "I received the DM-4600, and it was very easy to put together. I tried it out, and was impressed on how it worked. Now I will be able to ride when the weather is bad. Thank you for this product. John from Westland, MI"
View info about our Fitness Equipment, and see our other exercise bikes and stationary bike info. Dimensions: 39" x 32" x 9"
Discontinued Sorry, the manufacturer is out of buisness.